The Sail Melbourne Kiteboarding Championships are being held at Hampton Beach from 10-12 November as part of the ISAF Sailing World Cup Carnival. The event is presented by Cabrinha and KBV. Kiteboarding is being considered as a demonstration sport in the in the 2016 Olympic games in Rio De Janeiro. Competitors in this internationally recognised sailing competition may have a chance to participate at the Olympic games! Winners will receive a recognised medal from Sail Melbourne. Plus Cabrinha and SHQ will provide prizes to the winners on the day. 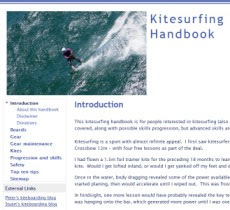 The event has been created to cater for all levels of kiteboarding ability. The Kiting portion of the Sail Melbourne World Cup week will be held Thursday, Friday and Saturday, 10-12th November, at Hampton Beach.